“In the blog culture of today, images and musings can get buried in the online archive of some of our favorite sites – a metaphorical pile where we often forget what is at the bottom of this digital stack. 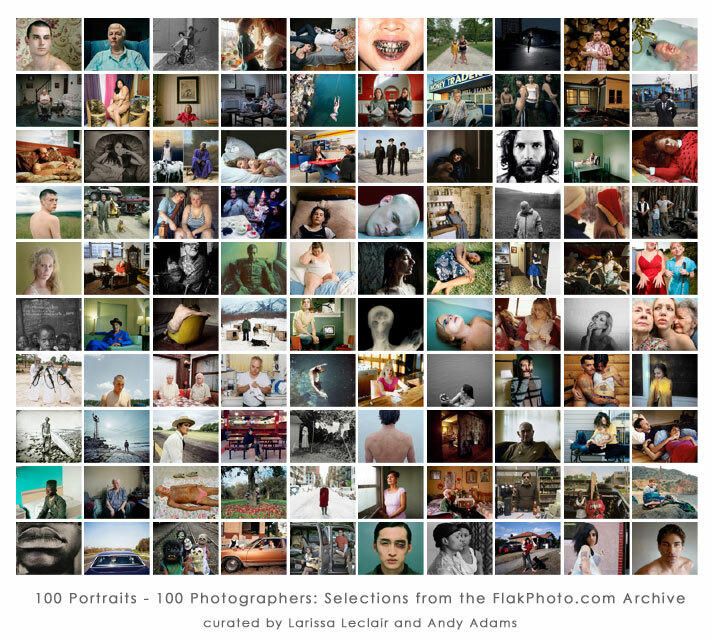 So it was with great pleasure that I was able to revisit the FlakPhoto archive with Andy Adams to select work for ’100 Portraits – 100 Photographers.’ It is important to take a moment and return to the archive whether that is a collective archive or the archive of your own personal work.” – Larissa Leclair, from “NightGallery: Behind the Projections” curator talk, Corcoran Gallery of Art, November 6, 2010. 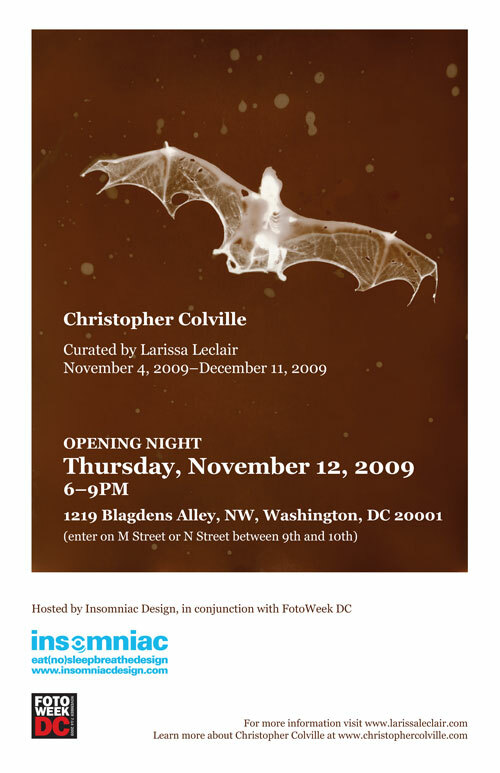 As an added fine art component to FotoWeek DC‘s NightGallery projections, this screened exhibition features 100 dynamic portraits from an exciting group of contemporary photographers in all stages of their careers, each selected from the digital archive on FlakPhoto.com. Our decision to highlight work from this website celebrates the role that a thriving online photography community plays in the discovery and dissemination of work produced by significant artists in the Internet Era. Contemporary photo culture is marked by a continuous flow of images online, and our aim is to take a moment to recognize some of the noteworthy photographs published in this ever-expanding archive over the past four years. In this context, projected several times larger than life, these portraits look back at us and embody a louder voice in the discourse of the gaze. Sincere thanks to each of these photographers for being part of this exhibition! 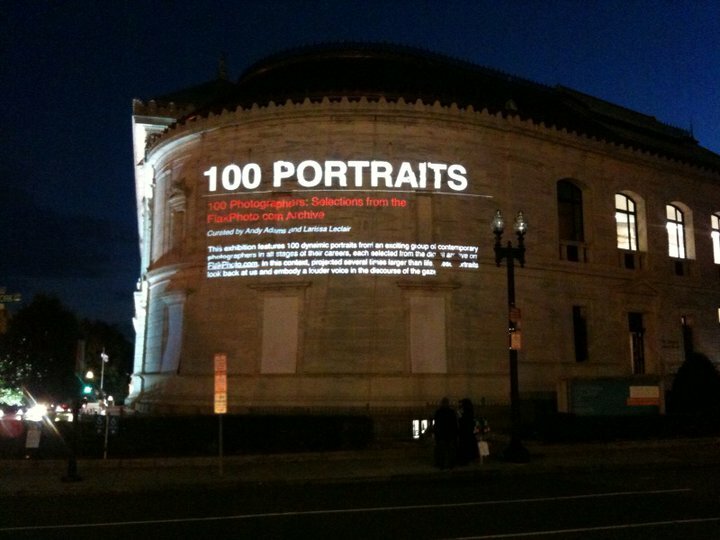 The FotoWeek DC projection screened throughout Washington, D. C. during the week of the festival at several exhibition venues: on the exterior of the Corcoran Gallery of Art, in the Satellite Central projection theater, at Dupont Circle and on screens fixed to trucks traveling throughout the streets of the city. See more photos from the Corcoran Gallery of Art. Since Andy Adams launched the online component to our exhibition in early November, “100 Portraits” has been viewed by more than 30,000 visitors from 24 countries and the project has been featured in Wired Magazine, The New Yorker, National Public Radio, aCurator.com and The Washington Post. Thank you to everyone who featured “100 Portraits.” See the press recap here. Out of all the events and images in a recent Corcoran Gallery of Art e-newsletter, there was one photograph (shown above) that just totally engaged me. I had to know more about the image and the photographer. 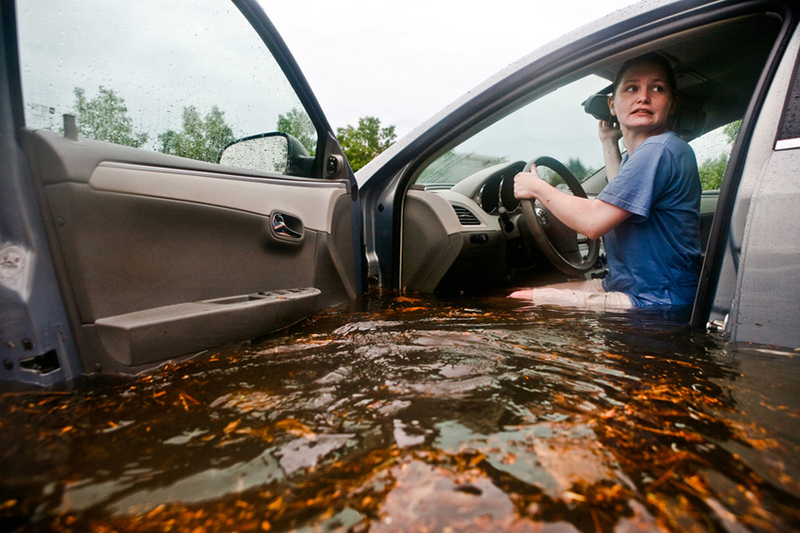 So I caught up with Tucker Walsh, a photojournalism student at the Corcoran College of Art & Design, currently in his sophomore year, to find out more about Flood and what itâ€™s like to be a student these days. Walsh won first place in the amateur category for FotoWeekDC/Newseumâ€™s FOTOBAMA Contest and his work was recently included in the Corcoran Undergraduate Juried Exhibition by Jose Dominguez. He is definitely someone to watch. Tucker Walsh: I took a few basic photography classes in high school and a couple workshops during my summer breaks. 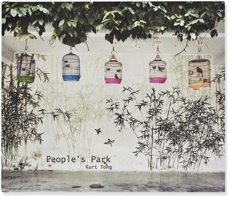 When I was sixteen, I spent a month in Asia with Rustic Pathways on a trip that was geared towards young photographers. I would say that was when I first found my voice as a photographer. LL: How is it being a student at the Corcoran? TW: The Corcoran College of Art & Design, in the same building as the Corcoran Gallery of Art, is very small â€“ around 400 students â€“ which allows for lots of one-on-one attention with your professor. The best part is just living and learning in D.C.. I ride my bike past the White House every day to get to class. Talk about some good motivation! LL: I wonder if websites and blogs are integrated into your curriculum. Are there some that are required reading? Do professors encourage students to have a blog? TW: This semester we were actually all assigned to create a Twitter account, so we could use social media’s power to communicate outside of class. I have come to really appreciate what something like Twitter can do. But overall, our professors mainly assign books and news articles to read. I would highly recommendÂ Photojournalism by Ken Kobre. Itâ€™s basically the textbook for photojournalists. I have a blog. It is a lot of fun but also a lot more time consuming and stressful than I anticipated. I started it thinking I would put up photographs and work that wasnâ€™t strong enough to be on my website but was still worth sharing with friends, family, or classmates. Itâ€™s now turned into basically a second website. 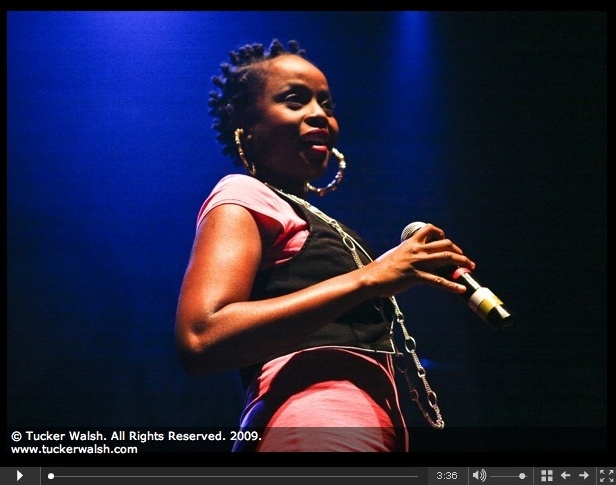 Iâ€™m thinking about scrapping my website and just using the blog format as a work showcase. This would allow for much more viewer interaction, with commenting, social media, photo rating, etc. LL: What blogs do you read? TW: NYTimes Lens, NPPAâ€™s Visual Student, Prof. Kobreâ€™s Guide to Video Journalism, Multimedia Muse, PhotojournalismLinks.com, Burn Magazine, MediaStorm, Huffington Post, and NPRâ€™s Picture Show. LL: On your website you call yourself a visual journalist. 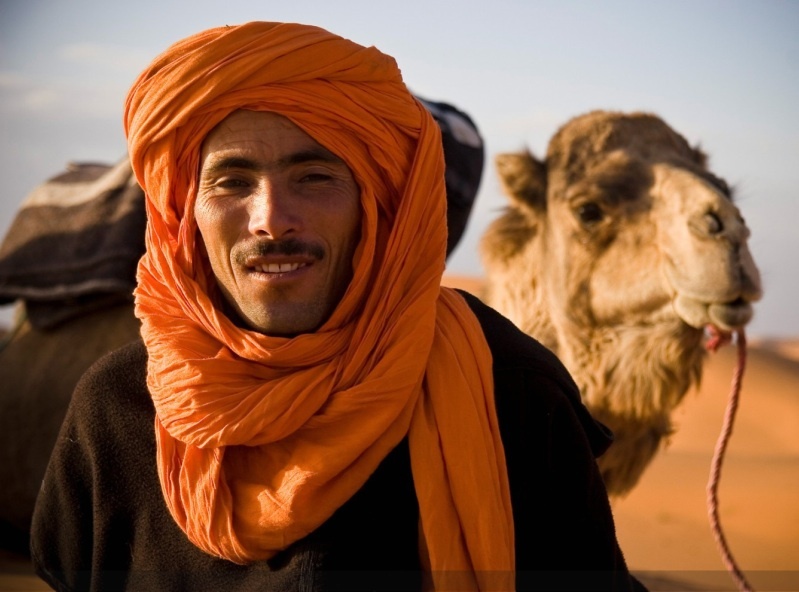 Why the distinction from photojournalist? TW: Ultimately, I hope to produce long-term, web-based documentary projects that use still images, video, web design, graphics, text, audio, etc. to tell the story. When I think of photojournalism, I think of a single image on the front of a newspaper, or perhaps a six image picture story in a magazine, or even a two-minute audio slideshow on a newspaper website. My goal is to take a step back from the 24-hour news cycle and combine the visual brilliance of Ron Fricke with the quality storytelling and journalism of NPR. A good example of this is”Ian Fisher: American Solider.” Another example is Scott Strazzanteâ€™s â€œCommon Groundâ€�Â on MediaStorm. I find it is a more in-depth and rounded look at a story that we often only hear about in small pieces. So to answer your question, I think the name â€œvisual journalistâ€� is more open-ended and mindful of the changes that need to take place in the industry. But hey, itâ€™s just a name! LL: Okay, so tell me about the flood photo that made me track you down? TW: I took the flood photo last summer while I was doing an internship at The New London Day newspaper in Connecticut. I talk about it on my blog. (Read the entry here.) 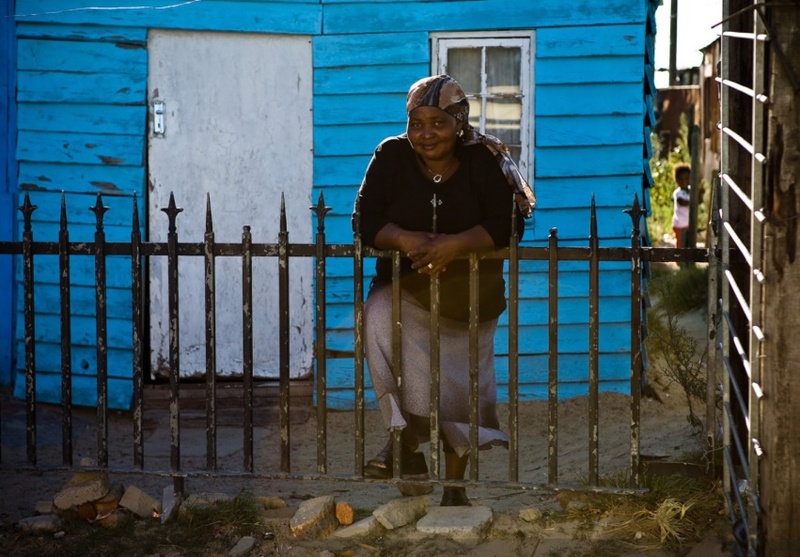 I submitted that photo and two others to the annual Corcoran College Undergraduate Juried Exhibition, and I was honored to receive â€œFirst Placeâ€� for the flood image. Another photo of mine, from a Barack Obama rally, was also in the exhibit, along with some truly amazing work from other Corcoran students. LL: And tell me about the FotoWeek DC winning photograph (shown above). TW: The photograph that won first place in the amateur/student category of FotoWeek DCâ€™s â€œFOTOBAMA Contestâ€� was taken on election night in front of the White House. My friends and I were all watching the numbers come in on CNN, and when the news broke that Senator Obama would become President Obama, we immediately jumped up, grabbed our cameras, and dashed down Pennsylvania Avenue to the White House. There was only about one hundred other college students there when we arrived. However, within half and hourâ€™s time, there was well over a thousand people right in front of the White House, all of whom were going absolutely crazy, jumping up and down, dancing, singing, and screaming. It was also raining, which added to the insanity! I ended up staying down there till 4:30 am, snapping photos and taking in the pure joy that seemed to unite all of DC for a short period of time. 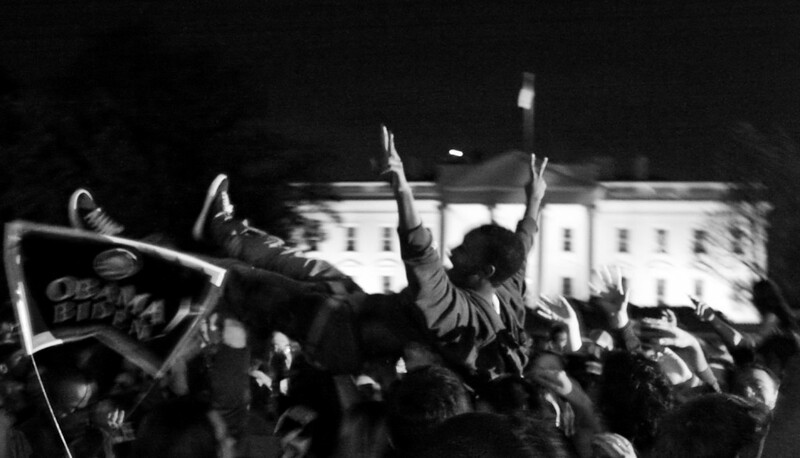 The shot that won the FotoWeek contest was of an African-American man crowd surfing with two peace signs in the air directly in front of the White House. I was shooting with a wide angle lens at 3200 ISO with a Canon 20D, so the final image was very noisy, blurry, and cropped to correct a heavy tilt (I was taking photos while dancing). In a way, however, the quality of the image reflected my memory of the event. The whole night was a giant blur of craziness and celebration. I converted the image to black&white to give a sense of memory and timelessness. The winning images from the contest are currently up for display above the Crystal City metro stop. LL: What are you working on now? TW: I am in the process of applying to Salt Institute For Documentary Studies in Portland, Maine. If accepted, I will spend my next fall semester there. Salt is a small, private institution that has three tracks: photography, radio, and writing. Students spend the entire semester documenting one photo story, as well as one story in collaboration with a writing student. I was born in Portland and consider myself a â€œMaineiacâ€� at heart, so the idea of spending an entire semester documenting stories there really excites me! LL: Last question, what photojournalists do you admire/follow? TW: The bodies of work that inspire and motivate me on a daily basis are David Burnettâ€™s â€œ44 Days In Iran,â€� Pam Spaldingâ€™s â€œAn American Family,â€� Edward Burtynksyâ€™s â€œOil,â€� Ed Kashiâ€™s â€œOil in Niger Delta,â€� Ernesto Bazanâ€™s â€œCuba,â€� and Jenn Ackermanâ€™s â€œTrapt.â€� The list could go on and on…Ami Vitale, Adam Ferguson, Charles Ommanney, Jonas Bendiksen…Then there is Henri Cartier-Bresson, Sebastiao Salgado and James Nachtwey who are just magicians at what they do. Documentary films have also influenced me just as much still images have. Some that I would recommend to photographers are Grizzly Man, Baraka, Born Into Brothels, The Cove, War Photographer, Cry of the Snow Lion, and War Dance. Check out Tucker Walsh’s website and blog. Follow Tucker on Twitter @PJ_Tucker. I love photography books and this year for FotoWeek DC I was part of the Photobook/Publisher Exhibition Committee. 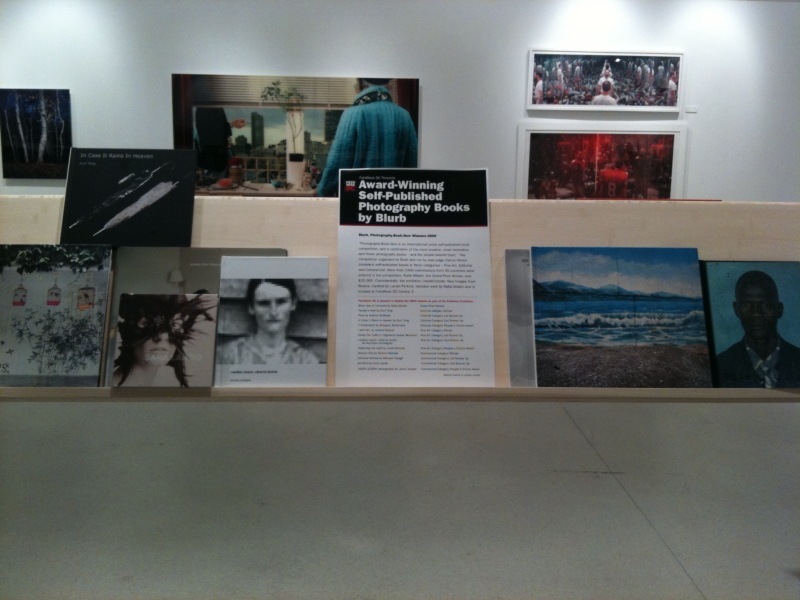 Over 250 books are being displayed this week at FotoWeek DC on M Street in Georgetown from over 50 publishers. A unique inclusion this year, spearheaded by myself, are the Photography.Book.Now 2009 Winners. What amazing work! Congratulations to all the winners. â€œPhotography.Book.Now is an international juried self-published book competition, and a celebration of the most creative, most innovative, and finest photography books â€“ and the people behind them.â€� The competition organized by Blurb and run by lead judge Darius Himes considers self-published books in three categories â€“ Fine Art, Editorial and Commercial. More than 2400 submissions from 50 countries were entered in the competition. Rafal Milach, the Grand Prize Winner, won $25,000. Coincidentally, the FotoWeek DC exhibition InsideOutside: New Images from Russia, curated by Lucian Perkins, includes work by Rafal Milach. As WPOW evolves from a local organization into a national nonprofit, the show represents the organization’s mission to connect to and educate the public of the work of women photographers, appropriated titled Launch. Members entries were to embody the words “embark, initiate, introduce and propel” as the theme of this show. I briefly caught up with Melanie McWhorter, one of the curators of the exhibition and friend from my Santa Fe days, to ask her a few questions. I’m excited to see that you are part of FotoWeek DC this year! You are one of the curators for the Women Photojournalists of Washington exhibition “Launch” at Honfleur Gallery. How did you get involved? Melanie: Susana Raab is a member of this organization and she emailed to see if I would be interested. I was an admirer of her work and was lucky that she signed up for me to take a look at her portfolio at PhotoNOLA. From the meeting, she and I developed an even deeper level of respect for what each person does in the “photo world”. Her work was included online at photo-eye and I included her in a group show for Fraction. She suggested me as a juror for WPOW competition. I was invited by Beth, the coordinator, to be a juror for the annual competition of WPOW themed Launch. I was honored to be the only juror not directly involved in the fields of documentary or photojournalism. Can you talk about some of the photographers included in the show. Melanie: Well, it is difficult to judge the strength of a photographer’s aesthetic or their ability to effectively use the photographic medium with just one image and within the confines of a themed exhibition. I was pleased to see a few images included by Amanda Lucion, Carol Guzy and Gabriela Bulisova and that many of them fit into the given theme of the exhibition. Lucion’s images of migrant workers revealed the hardships of this lifestyle. Guzy included captions for each image giving much needed context to the photographs of the women of Sierra Leone in a project she calls “Birth & Death”. Finally, Bulisova’s images, much less descriptive and even “artsy”, shows of the plight of Iraqis in the US. Will you be at the opening? Melanie: I wish I could be at the opening. Fotoweek will be an exciting time in DC. Deborah Stockton holds one of her ducks on her farm in Ivy, Virginia. Stockton is a board member of Virginia Independent Consumers and Farmers Association that promotes farmer-to-consumer trade. She says that Albemarle County, Virginia could feed itself several times over with food grown and raised locally. Six years ago they were fishermen, not ferrymen. But now, in the Haifa neighborhood of Baghdad, sewage runs through the narrow alleyways directly into the river. Waterside restaurants stand abandoned, their owners still afraid to open their doors. The fish have disappeared. “Every minute, every hour, pregnant women die in Sierra Leone.” -Amadu Sesay, brother of Jemelleh Saccoh who died giving life. Women lay on threadbare gurneys in a ward infested with mosquitoes and the stench of urine and death. Bintu Kamara, 28 years old, waits in the labor ward of Princess Christian Maternity Hospital in Freetown. She survived an emergency C-section but her baby was stillborn. Three generations of Iraqi women — a grandmother, a mother, and a daughter — were violently separated and forced to flee to three different countries. Now, after three years of experiences none of them want to recall, they are finally living together as new American residents. However, even in the United States, they live in hidden exile, unable to reveal their identities for fear of being discovered by their male relatives and Iraqi anti-American forces. The mother, a former Coalition Provisional Authority employee, was labeled a “collaborator” and targeted with assassination attempts. They rely on their strong Christian faith to remain hopeful about their future in the U.S.
After Molly Hoopes, 18, a heroin addict, spent 28 days in prison, she was court-ordered to live at a residential treatment center for adolescent addiction known as “Bassett House,” in Athens, Ohio. A month earlier, her twin sister, Morgan Hoopes, was in treatment at this same facility for drug addiction. “I came here the day she left. We’ve never been apart for more than 12 hours until we were sent to jail. I’m court- ordered not to see her and can’t talk to her. She was sneaking drugs to me. But I love Morgan. She is the only person I want to be with,” Molly Hoopes said. Thank you Melanie for answering my questions in the midst of releasing flash flood: issue two! Check that out here. And come to the opening for “LAUNCH” tonight! Radius Books has just published Violet Isle, a poetic photographic portrait of Cuba, by Alex Webb and Rebecca Norris Webb. This unique softbound book with a recycled cardboard-esqe slipcase is yet another great example of Radius’ creative approach to photography book design. Ricco Maresca Gallery in Chelsea is hosting the book launch party and reception for the exhibition this evening, Thursday, November 5 from 6-8pm. 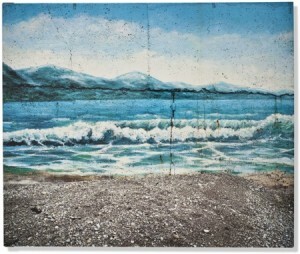 The exhibition at Ricco Maresca will be up until January 2, 2010. There is also a gallery talk and book signing this weekend at the gallery on Saturday from 4-6pm. If you are in DC next week, Violet Isle, as well as seven other recently published titles by Radius Books, will be on display in the Publisher Exhibition of FotoWeek DC at 3333 M Street NW. 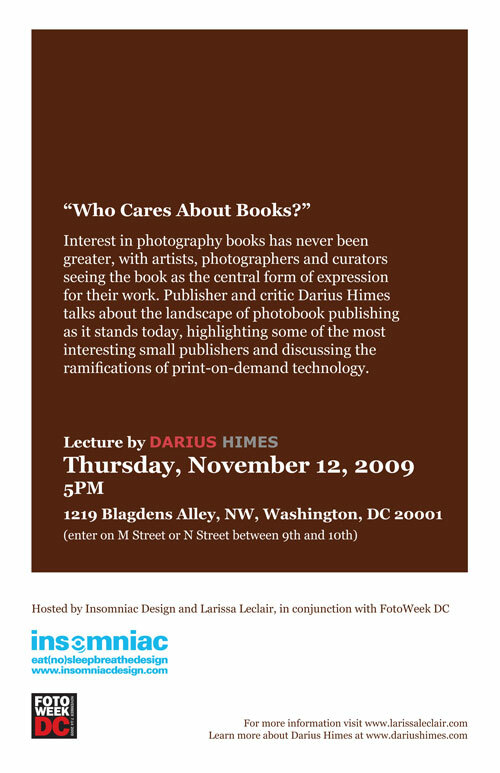 Darius Himes will also be in town giving a talk, “Who Cares About Books?” on Thursday, November 12, 2009 at 5pm at 1215 Blagdens Alley NW. Come by! The critically acclaimed exhibition We English at Klompching Gallery is closing this weekend. If you missed the show like I unfortunately did, there are other ways to enjoy the work of Simon Roberts. FotoWeek DC, the annual photography festival uniting the photographic communities, galleries, and museums in the nationâ€™s capital, will be happening again this November throughout the city. Simon Roberts will have work up at the Swedish Embassy in the exhibition What Lies Beneath: Nature and Urban Landscape in EU Photography curated by Judith Turner-Yamamoto. The exhibition opens on November 7. 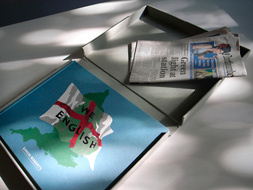 Available through Klompching Gallery is the limited edition box set of We English that includes a signed book, a signed print, and a local newspaper from Roberts’ travels around England. Edition of 100. In the UK, the limited edition can be purchased here. And if that is not in your budget, Andy Adams and Flak Photo are partnering with publisher Chris Boot, Ltd. to give away three signed copies of the trade edition book. Become a fan of Flak Photo on Facebook and visit the â€œBook Giveawayâ€� tab. Deadline for entries is November 1, 2009. You are currently browsing entries tagged with FotoWeek DC at Larissa Leclair.